One of the harder parts of getting started with ottoneu Fantasy Sports is finding the right league. Not everyone has 11 friends available for a time-intensive dynasty league, and joining a league of strangers can be a little awkward. Some leagues and owners are able to overcome this initial hurdle, but ottoneu leagues are more fun and more active when all the owners are comfortable with each other. To that end, we’re trying out a couple of things with ottoneu Fantasy Football that should make it to ottoneu Fantasy Baseball before the 2016 season. First, you can see the league’s founder on the Join League page, with an easy link to email this user. Only logged-in users can email league founders, so make sure you are registered and logged in. The goal is to encourage users to email founders of leagues they’d like to join and see if the fit makes sense. Secondly, an availability board has been set up to allow owners to post their availability for ottoneu Fantasy Football leagues. The goal here is to turn this message board into a great place for leagues to recruit new owners. There is still plenty of time to join ottoneu Fantasy Football leagues, so please check out both features and let us know what you think! I read through all the comments in the post about the database and realized something important: some ottoneu Fantasy Baseball players seem to think Baseball is going to be negatively affected by Football. Nothing could be further from the truth. While ottoneu is a one-person (me!) company, there is currently enough time in the day to keep building and improving both Fantasy Football and Fantasy Baseball until there is enough revenue to justify growing the company. Now, onward to the Fantasy Baseball improvements! First, the Trade Wizard now has a confirmation screen, so you can double-check your trade offer before it ends up in someone else’s hands. This much-requested feature should reduce the number of loan mistakes in your trade offers and allow for more complicated trade offers to be put together. Second, the Live page was re-written to make it faster to see how other teams in your league are doing. It is still a little slow to initially load, and I’m continuing to make that page faster since I know the majority of you check it daily. Third, the Roster Organizer was made accessible year-round, as some owners indicated that they’d like to use this planning tool even while the season is on-going. Fourth, I rolled out some new information on player cards. Average salaries, projected positional eligibility, and ownership percentages are now available on player cards, so you can make smarter personnel decisions. Finally, I’ve started work on a tool that will allow commissioners to retroactively change lineups. It is being built to directly address the kind of data loss that occurred last Friday. This tool will have a significant number of checks in place to prevent it from being used inappropriately. I’m hoping to roll it out to a few leagues towards the end of this season and it should be available to all baseball leagues this off-season. On the Football side, more steps were taken to ensure that another database event never occurs. I now feel confident that the mistake I made Friday night cannot be replicated, and that if another database event occurs due to my error or any other reason that there are more fallbacks than were in place last week. As always, find me on Slack, e-mail, or leave a comment here. Last week was all about creating and joining football leagues. This week was wider in scope and full of interesting changes. On the ottoneu Fantasy Baseball side, I pestered FanGraphs into giving me live scores of MLB games. By pester, I mean I asked nicely once. Integrating this data was not hard, and now live game scores are on the Live and Lineups pages. Doubleheaders are presented better on both of these pages as well. Now you can keep tabs on both your fantasy players and your favorite team from one page! A lot of progress was made on ottoneu Fantasy Football this past week. Leagues can be created and joined and (most importantly to me!) paid for, which are the majority of the milestones ahead of release. Today I started working on another major milestone: the auction draft. The interface is going to look a lot like the ottoneu Fantasy Baseball system one for now. However, player search is much faster and drafts should generally go much quicker, since there will only be 20 roster spots to fill instead of 40. I also experimented with Flex and Superflex on the new lineup pages. The good news is that they both now work properly. The even better news is that proof-of-concept 1 Flex, 2 Flex, and Flex+Superflex roster arrangements all work properly, which means that ottoneu Fantasy Football will launch with some form of lineup customizability. Between this and the scoring options, ottoneu Fantasy Football’s week to week experience should be varied and interesting for all kinds of fantasy football owners. This upcoming week is going to be all about the auction draft. I’m hoping it will go quickly by utilizing the best parts of the ottoneu Fantasy Baseball auction draft system. There could be an alpha test as early as mid-June on some of these features, so please let me know in the comments if you are interested! TL;DR – ottoneu is now mostly responsive and works much better on mobile devices, so visit on your mobile phone and let me know what you think! In my last post, I dug into some of the most common ottoneu feature requests and built as much as I could during a little break from my day job over the holidays. When I first requested feature ideas on Facebook, and really every time I’ve ever asked the community for their wishlist, there is one common request that I wasn’t able to address over the holidays – a mobile app. Maintaining (at least) two native apps while also maintaining the platform is a heavy ask for a single person who is, for now, running ottoneu as a side project. With regards to #3 above, apps mean unique development for each mobile platform, a lack of support for future devices, and less than instantaneous addition of new website features. A mobile-friendly web layout addresses all of these issues. In reality, all these issues I’ve enumerated boil down to one thing – I’d rather try to build one thing (the core website) well, instead of three things (website, iOS app, Andoird app) poorly. With all this in mind, I started digging into a mobile-specific layout for ottoneu this weekend, and I made a lot more progress than I expected! I am continuing to tweak little things here and there, but you can see it in action now. You will need to clear your browser’s cache to see the latest changes, and if you don’t take this step the site will look broken. Please check it out and let me know if you have any questions, concerns, or notice potential for improvements. Counter-offers on trades – You just received a big trade offer and the deadline is looming. You don’t want to accept this particular offer, but at least it is a starting point in finally nabbing that superstar that will push you over the hump. If you’re grinch-like and press the Reject button, you have to build a counter-offer completely from scratch. Once I’ve built out this option, there will be a nice “Counter-Offer” button next to “Accept” and “Reject” that will allow you to keep chasing that elusive blockbuster trade. 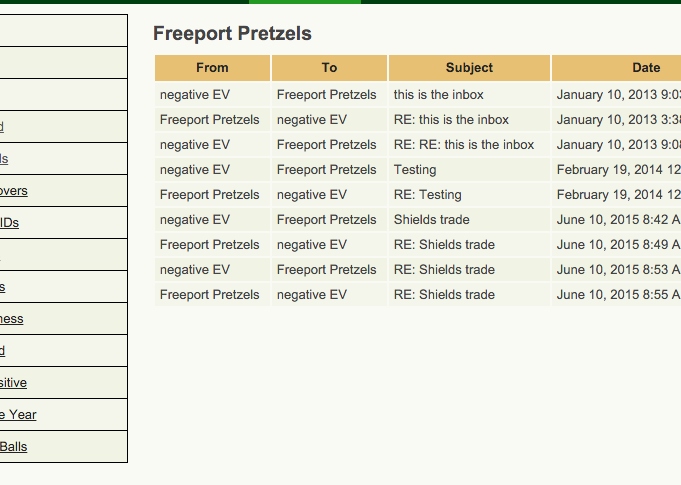 Trade email should include reason trade was rejected – Ok, so your trade was rejected – why? Surfacing this information more directly via email will save you a few clicks. Sortable headers for watchlists – To be honest, watchlists are a feature I had never considered when I launched ottoneu, and I still don’t use them to their full potential. But, you asked and you shall receive. Watchlist notes – You can thank Michael J. Shank for this request: “Notes for each player on the Watchlist so I can remember why I added them.” Because, sometimes, we forget. League History (historical how teams finished) – What’s the point of a dynasty league if you can’t brag about winning 2 years ago? You can view old standings now, but I’ll make it more accessible. Some way of designating who won the most recent season – We are now getting into some reach goals, but with a little focus and determination I can possibly make this happen. (possibly make this happen..) I don’t have anything in mind for this just yet, but I know that past champs will have their day. Link to average value page – Hey, did you know this page exists? Wouldn’t it be great for it to be at your fingertips when you are about to bid on a player or prepping for your auction draft? Yeah. Link twitter/facebook to your account and have that show up on team pages you own – Ah ottoneu, bringing people together over the shared love of stats, baseball, and fantasy sports. Or something. Maybe a begrudging respect. Either way, you’ll have the opportunity to connect outside the world of ottoneu. I’ll get started on these specific goals soon, and I’ll keep you all updated as they get checked off my list. UPDATE 12/23 11:46pm ET: Watchlists have been updated! Sortable headers and notes have been added, check ’em out. 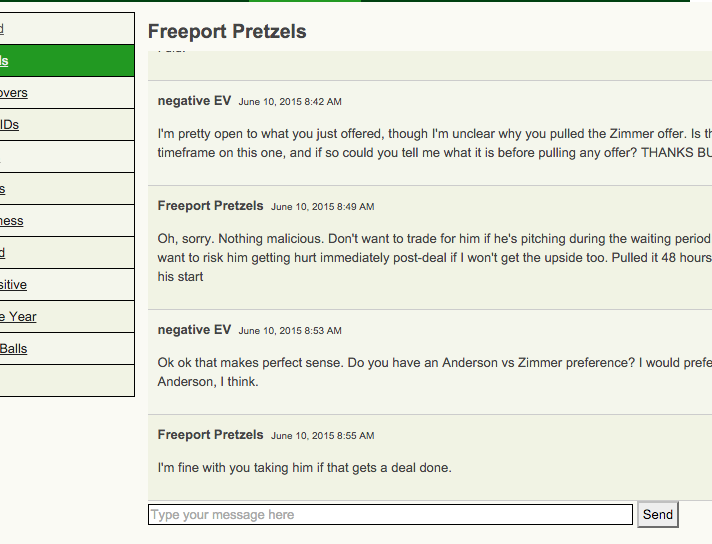 UPDATE 12/24 6:04pm ET: Counter-offer button up, and emails now show a reason a trade was rejected, if any is given. 1-4 are done, and 5 & 6 are next up. UPDATE 12/24 6:22pm ET: Past standings are now easily accessible on the standings page. Go forth and brag! UPDATE 12/24 11:04pm ET: The team page of the most recent league winner now says they won the league last year. More bragging! UPDATE 12/25 6:18pm ET: A new feature, the record book, has just been rolled out. Go to the Tools tab (where Average Values now lives, permanently) to see it. Maybe not the father of fantasy baseball, but at least a pretty influential uncle, Ron Shandler is the real deal when talking about one of the game’s great minds. He presented a new approach to fantasy baseball at the conference, one which is similar to my game in a number of ways. We met (along with Geoff!) for a hour after he presented his game, and he came away with a very favorable impression of what I’ve been working on. He even mentioned it as legit to the entire conference. If that isn’t a strong endorsement, I don’t know what is. Joel Henard at Baseball Prospectus Radio offered to interview me for his show. Repeat: I was offered an interview. About a fantasy baseball game. From the guy who has interviewed real, actual GMs and baseball players. Joe Sheehan recognized me coming up an elevator and asked if I’d be around later at the Rising Stars baseball game or for poker later on. Swoon. The amazing thing about having people, real live people validate what you’re spending hours a day working on – what you’ve left a safe, comfortable job, to work on – is that it makes you forget everything else. It just makes you want to f’n code the hell out of it. So, I’ll say it again: let’s go.